For financial advisors, effective prospecting ideas and strategies are essential to growing a financial practice. Even though prospecting is an important part of an advisors job, it can be a challenge for some — it’s not unusual for advisors to struggle with getting in front of clients. However, prospecting is one of the most vital parts of selling, and advisors will not be able to grow their practice without bringing in new clients. Today’s successful financial advisors and investors are usually the ones who do the most prospecting through most of their careers. Because prospecting is so important, we are going to cover some prospecting ideas and strategies that financial advisors can put into their work immediately. Prospecting is essentially the initial step in a sales process. It consists of identifying potential clients, or prospects. For financial advisors, the goal of prospecting is to develop a database of likely clients and then strategically communicate with them in the hopes of converting them from prospect to client. Another reason why advisors need to prospect is that, the ugly truth is, clients will likely leave their advisor eventually. With relocations, divorces, deaths, and other events, a financial advisor’s client base can quickly dwindle. Prospecting should be a continuous, ongoing task for advisors to ensure that their revenue growth never slows down. Fear is one of the main things holding financial advisors back from going out and prospecting. And, with prospecting, being fearful will quickly kill an advisors chances of success. Many advisors, in fact, choose to avoid prospecting when possible, and for two reasons: lack of preparation and fear of rejection. In order to be effective at prospecting, advisors must be knowledgeable about their day-to-day activities and the market they are trying to reach. Advisors who are prepared and confident in their services will have a much easier time approaching potential clients. Instead of viewing prospecting as a daunting task, viewing it as an opportunity to grow and succeed can help with motivation. is something that will always happen, no matter how good the financial advisor is. What many advisors don’t realize is that prospect rejection is almost never about them, but their offer and services. Some people will be interested in an advisors services, while others will have no need for them. It is important for advisors to remember that the whole point of prospecting is about uncovering potential clients. If someone isn’t interested, then they simply are not a prospect. Plus, it is important to remember that a ‘no’ is much better than a ‘maybe’. Advisors who struggle with rejection seem to think that a ‘maybe’ could be a potential client, when it is likely an easier way to say ‘no’. A Customer Relationship Management software can come in handy during prospecting. With all the potential clients out there, a CRM software will hold all the essential information needed when advisors are prospecting. CRM’s will let advisors know what prospects they have already contacted, who they need to follow up with, and what type of contact methods they used. Prospecting is not something you can wing. Advisors should create a script that they feel comfortable with. An advisors script should entail a brief introduction about themselves, their services and other essential information that the prospect may be interested in. Advisors who don’t have a script prepared will be less likely to get goods. Scripts give advisors something to say, will help them remain focused and consistent, and will likely improve their conversion ratios. An advisor who has been in the field for a while should have a pretty good understanding of what type of clients they enjoy working with. By identifying their preferred clients, advisors may be able to find patterns, like personality traits, values, and demographics, that can give them clues about their ideal prospects. Prospecting is already challenging enough for some advisors, they should be targeting people they want to work. For advisors who don’t have a big budget to work with, it may be worth committing more time than money. A community involvement is a great way advisors can spend time prospecting. Advisors who volunteer and get involved in community groups and associations will likely have more success in meeting more people and potential clients. Joining organizations is a great way for advisors to meet like-minded people who have a better chance of becoming their clients or referring other people to them that may benefit from the advisor’s financial services. It is important for advisors to join organizations they support and are passionate about, that way their chances of meeting similar people that they will enjoy working with will be increased. In today’s financial industry, having a niche market is crucial for financial advisors. Niches are an effective way to transform an advising practice and grow its income. An advisor’s time is limited and they will have to do a lot of prospecting to build a pipeline that consistently generates income for their practice. However, with a targeted niche, advisors will spend less time dealing with clients and receive better conversion ratios from the prospecting activities they do. Using proper niche marketing strategies, advisors can improve their efficiency and their sales ratios. A prospecting idea that is often overlooked by financial advisors is to develop relationships with referral partners. By developing relationships with CPA’s, estate planning attorneys, and insurance agents. By forming an alliance with referral partners, those partners will refer prospects to advisors, just as advisors send prospects back to their partners. Although these partnerships can be difficult to build, once established, advisors will likely generate higher revenues than advisors who those who don’t have referral partners. When interested prospects hear about, or is referred to, a financial advisor’s services, one of the first things they will likely do is search for the advisors website. The best things about websites are that they are constantly working for advisors. Websites are one of the best ways that advisors can find prospective clients because any website visitors are usually a lead. That said, it is important to have a website that is appealing and engaging or a prospect may immediately leave. Incorporate attractive design, engaging content, and valuable information that will make prospects more likely to be interested in an advisor’s services. In addition, advisors should ensure that their website is mobile-friendly, as most internet users use a smartphone to access content. LinkedIn. LinkedIn is a professional social network where industry professionals can connect, share stories, experiences, articles, and other engaging content. LinkedIn can be used to increase their referral network and connect with other industry professionals. Advisors should utilize this networking site by joining groups, connecting with prospects, and getting involved. Twitter. Twitter is essentially a news feed. Although Twitter requires that shared content is 140 characters or less, it requires a larger volume of posts to allow financial advisors to maintain an affinity of activity. Advisors should use Twitter to enhance client and prospect relationships and build their brand. 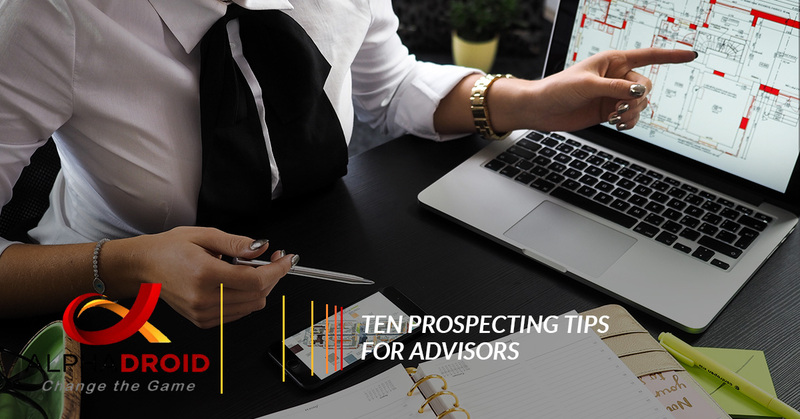 Hopefully these ten tips will make prospecting an easier and less daunting task for financial advisors and planners. Prospecting is essential to a financial practice growth and success. However, with time-consuming tasks, like portfolio management, many financial advisors do not have the time to go out and prospect clients. However, with the use of investment portfolio management tools, financial advisors can spend more time prospecting, and less time with client portfolios. For effective portfolio management, advisors need AlphaDroid! AlphaDroid is an elite portfolio management software that uses algorithmic trading strategies and sector momentum measurements to help financial advisors and investors determine which portions of the market are likely to outperform near-term. AlphaDroid helps advisors analyze, construct, and compare client investment portfolios. Want to learn how our portfolio management software can help you? Contact AlphaDroid today!